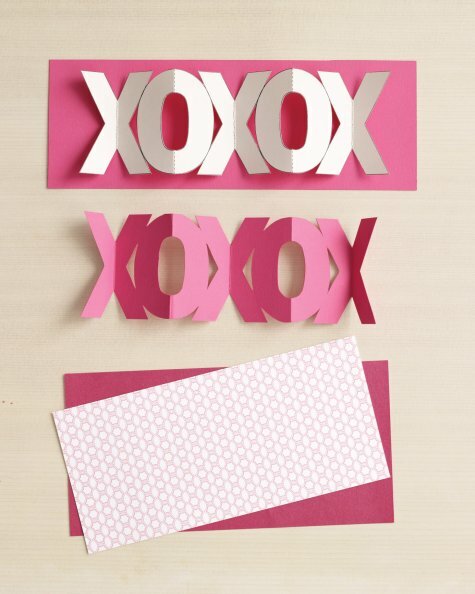 5 Gift Go-To’s: A Valentine’s Craftacular! Posted Thursday, February 13th, 2014 by Robyn Warner. ‘Tis that time of year again when our minds invariably turn to love and to showing the select individuals in our lives just how much they mean to us. Instead of whipping out your credit card to impress with diamonds and a dozen roses, why not show you care with something beautifully crafted by your own two hands? 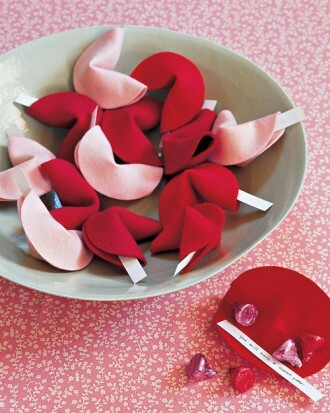 We squealed with delight when we discovered these charming felt fortune cookies from the brains at Martha Stewart. In addition to filling the cookies with small sweet treats, print (or hand write) inspiring messages to place inside as well. 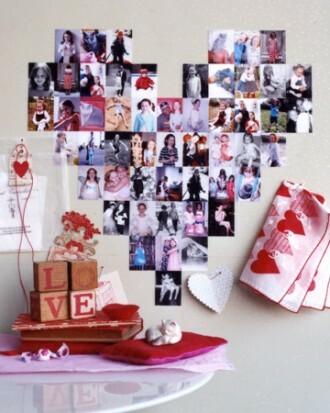 Stack family photos into playful wall art in the shape of a giant heart by arranging same-size vertical snapshots in a grid using removable double-sided tape. Who needs 3-D printing when you can still produce the three-dimensional effect the old-fashioned way? 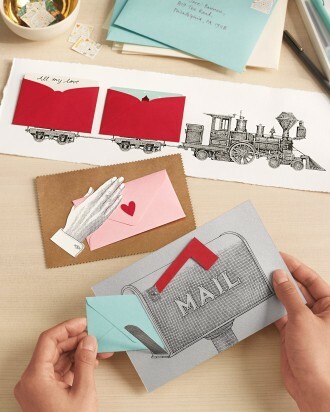 The various clip art illustrations available at this link require a few simple cuts and a couple of pieces of tape, et voila, you have a home-made Valentine’s Day card all set and ready to go for that certain someone. 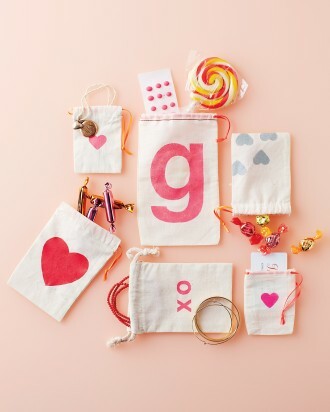 These decorated muslin bags are just right for wrapping treats for friends, loved ones or your kid’s classmates. Hand-printing on cotton fabric has never been easier when you create custom-made stencils out of freezer paper. Utilize a standard black-and-white photocopier to fashion your own artful wrapping paper. 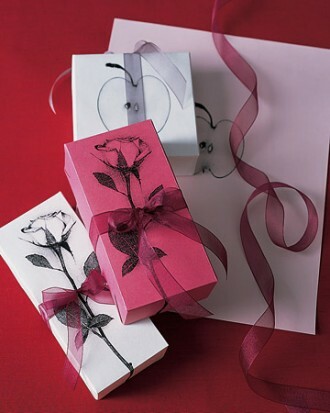 Wrap your presents with the paper, and finish them with a flourish of sheer satin ribbon. 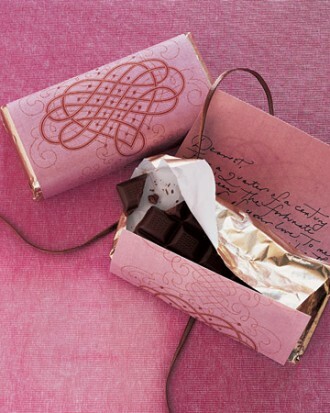 Store-bought chocolate repackaged in a homemade wrapper – the underside of which reveals a handwritten love note – tastes doubly delicious. Download the design, color-print and cut out. Embellish with sprinkles of glue and glitter, wrap around a foil-covered bar and seal with tape. Simple! 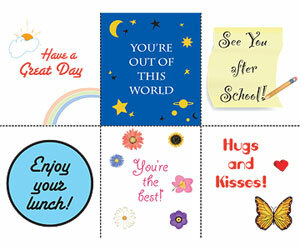 Pop these notes and mini cards into your child’s lunch bag or stick under pillows, in sock drawers or in favorite books on Valentine’s Day – or on any other day – for an unexpected surprise to remind your kiddos just how much you love them. 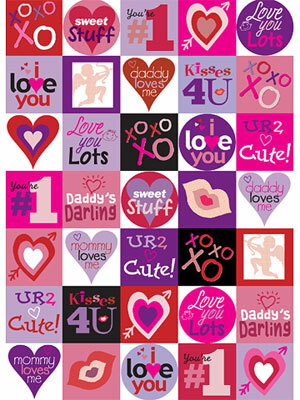 Print these stickers on full-sheet labels and then cut out to decorate cards, candy and presents. 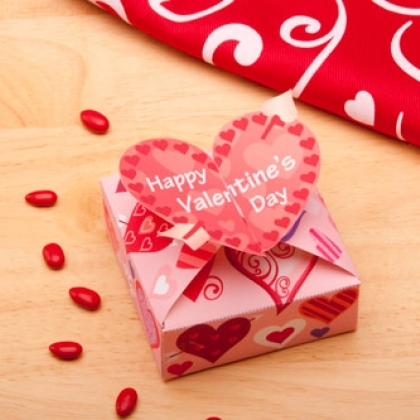 For more Valentine’s Day craft fun, visit our blog’s A Valentine’s Day to Remember: Paper Flowers post.